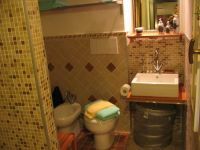 Renting an apartment in Rome instead of staying in a hotel can be both a big cost savings and a great way to immerse yourself into the Italian culture. 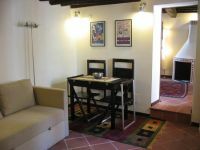 This is a third floor apartment located in Via dei Giubbonari, in one of the few historic buildings, served by elevator. 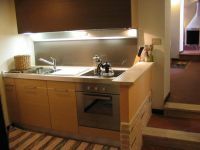 Ideal for two people it can comfortably accommodate four people. 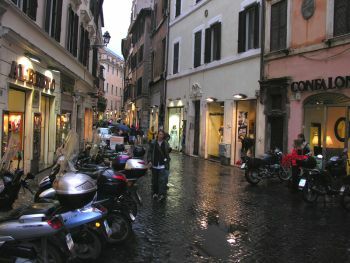 The building extremely close to Campo dei’ Fiori, (1minute walk) goes back to Medieval times, with its foundations on the walls of Pompey’s Theater (I century B.C), a huge piece of marble which can be seen in the hall. This cozy 65 sq. 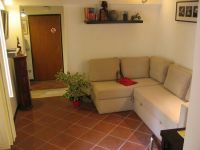 m. apartment, has been renovated in 2006 and equipped with brand new furnishings, including towels and linen. The living area has a sofa sleeper and dining table. 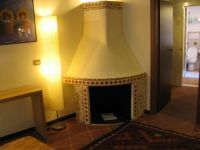 It is very nicely furnished with original medieval “cassettone” ceilings and “cotto” flooring. 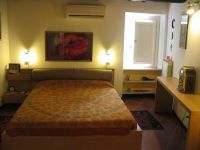 It has independent heating, air conditioning (heat-dry-cool), flat screen TV, Radio, DVD player with a collection of leading Italian movies and some movies for children. 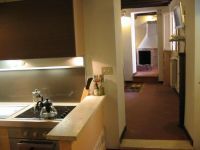 The apartment has a fully equipped kitchen with dishwasher and a selection of fine Italian wines. The bedroom with a fireplace has a wardrobe room and a bathroom with a king size shower. All windows are double paned, thus rendering the apartment soundproof. 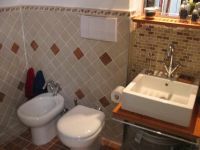 The second bathroom with new tiles and fixtures.